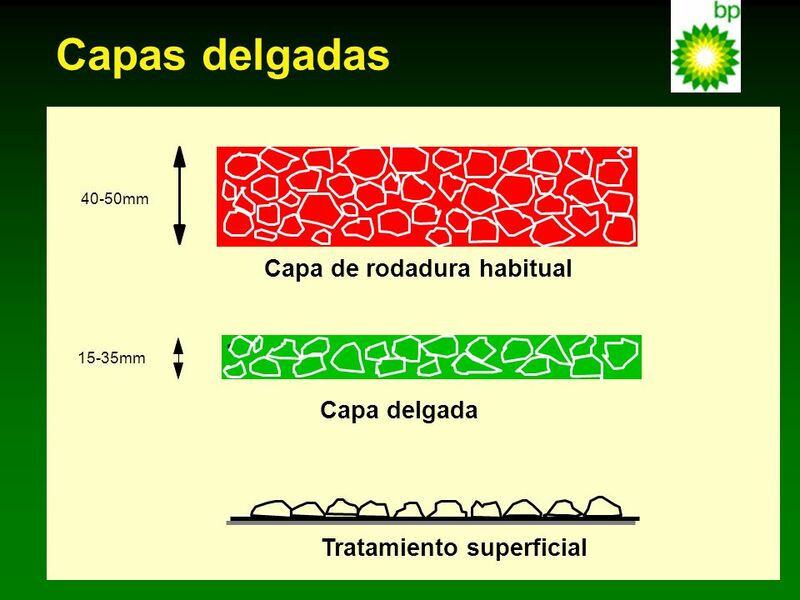 Within the context of this presentation, thin bituminous layers are defined as surfacing layers where the nominal laid thickness is two or less times the nominal maximum aggregate size. The concept of thin surfacings are not new; in fact, they have been used for many years, particularly in urban locations where there are restrictions imposed due to bridge clearances or kerb heights. However, developments in thin surfacings has widely extended their usefulness to main-line heavily-trafficked carriageways. Currently, this layers are being used in a whole range of surfacing applications both in maintenance schemes and in new construction contracts. This presentation covers the developments in thin layers and explains why their usage has become so popular in recent times. 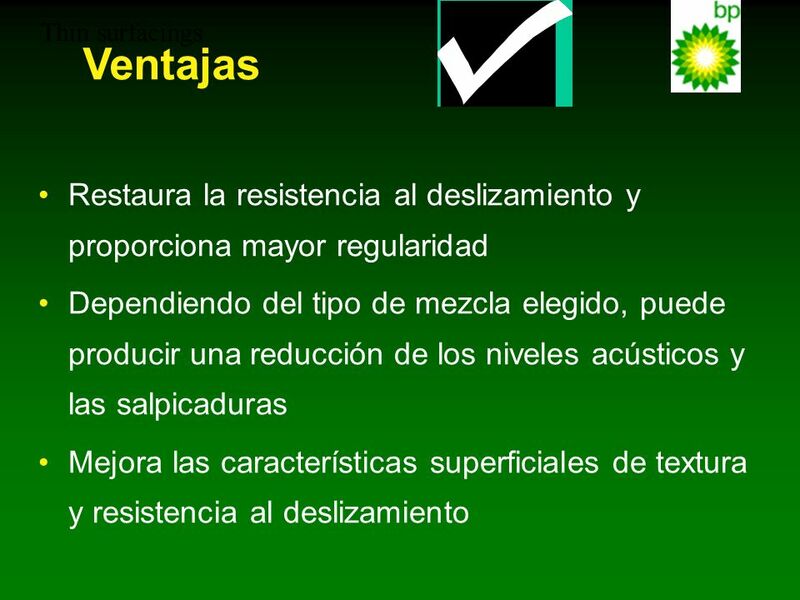 Textura Mantenimiento de la textura Resistencia al deslizamiento Mantenimiento de la resistencia al deslizamiento Impacto ambiental positivo (ruído, etc..) Beneficio para el conductor (calidad de conducción) Resistencia a la disgregación Resistencia a la fisuración There are many characteristics which are deemed desirable for surfacing layers, irrespective of the thickness to which they are laid. The surfacing not only protects the underlying layer, but primarily provides the running surface for traffic. In this respect, two principal requirements pertain: safety and durability. The performance of the surfacing will be determined by how long it will resist the continued action of both weather and traffic whilst still maintaining safety ‘performance’ properties. Thus, and particularly in the UK, texture and skidding resistance and the maintenance of both of them, are regarded as primary considerations. Environmental benefits such as noise reduction, spray reduction and even-ness of ride are considered attractive in today’s ‘green’ environment. The fact that less material can be used, especially quarried aggregates, is also considered environmentally friendly, thereby reducing the need for primary extraction of non-renewable resources. All this is in addition to the more usual engineering characteristics of resisting cracking, thermal-induced cracking, fatigue, ravelling and rutting. 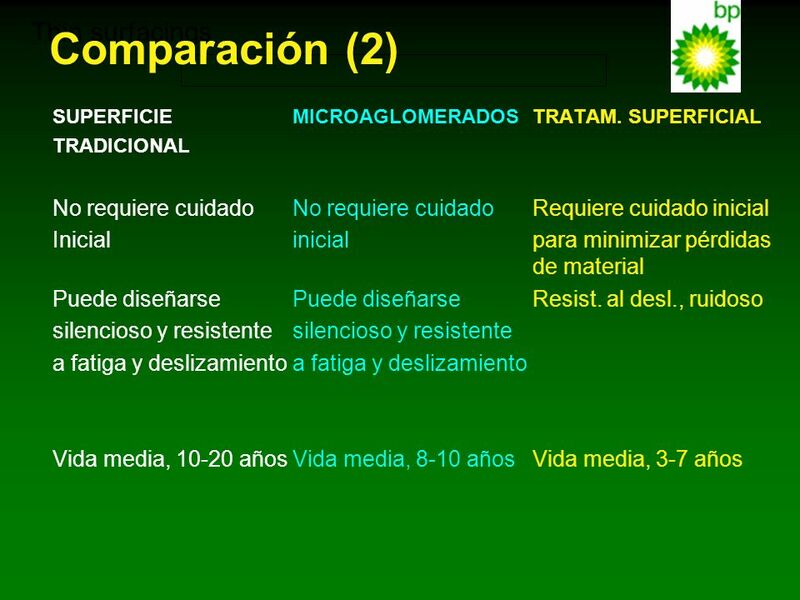 SUPERFICIE	MICROAGLOMERADOS TRATAMIENTOS SUPERFICIALES TRADICIONAL Gran uso de	Uso medio de	Bajo uso de materiales de calidad	materiales de calidad	materiales de calidad Buena capacidad	Capacidad	Incapacidad de para regularizar	para regularizar	regularizar Capacidad estructural Alguna capacidad Ninguna capacidad estructural	estructural Proceso de extendido	Proceso de extendido	Proceso rápido relativamente lento	relativamente rápido The easiest way to see how thin layers ‘fit’ within surface dressing and normal thickness wearing course is to compare the three types. In the comparison tables, the three types should be viewed as generic types. As can be seen, in some respects thin layers resemble thicker layers and in other respects they resemble surface dressing systems. In the design equations for structural strength, it is advisable that any structural contribution given by the surfacing layer should be excluded. It is far better to consider the lower layers as providing the structural strength and integrity to the road pavement and for the surface layer to ONLY provide the surface characteristics. 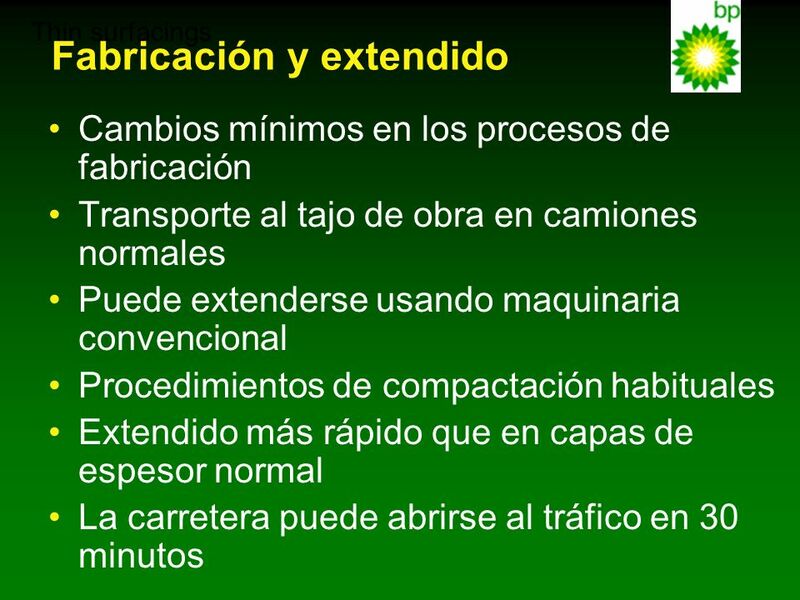 Where this recommendation has been followed, this aspect alone has greatly opened up the opportunity for using thinner surface layers because there is NOT the requirement for them to contribute to the structural bearing capability of the road. 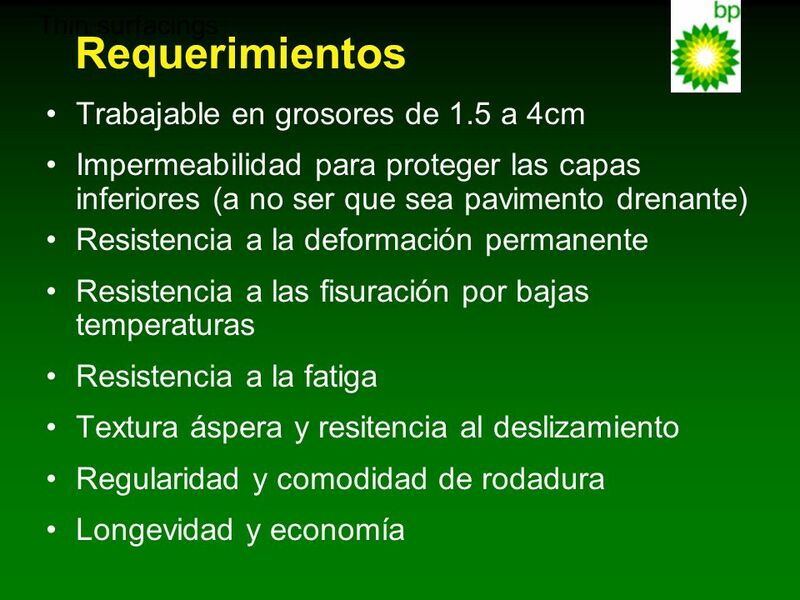 Thin surfacings Requerimientos Trabajable en grosores de 1.5 a 4cm Impermeabilidad para proteger las capas inferiores (a no ser que sea pavimento drenante) Resistencia a la deformación permanente Resistencia a las fisuración por bajas temperaturas Resistencia a la fatiga Textura áspera y resitencia al deslizamiento Regularidad y comodidad de rodadura Longevidad y economía Having established the desired surface characteristics expected from surface layers and shown their relation to the traditional surfacing markets, the highway engineer, highway specifier and end-user would all like to have a material which will meet, often, conflicting requirements. Some promotional information has falsely given the impression that the new thin surfacing layers will address all the issues and problems often associated with surface layers. Unfortunately, this is not the case and thin layers will continue, in common with ALL surface layers, to be a compromise material having to meet conflicting and heavy demands. However, this does not stop the engineer’s dream! 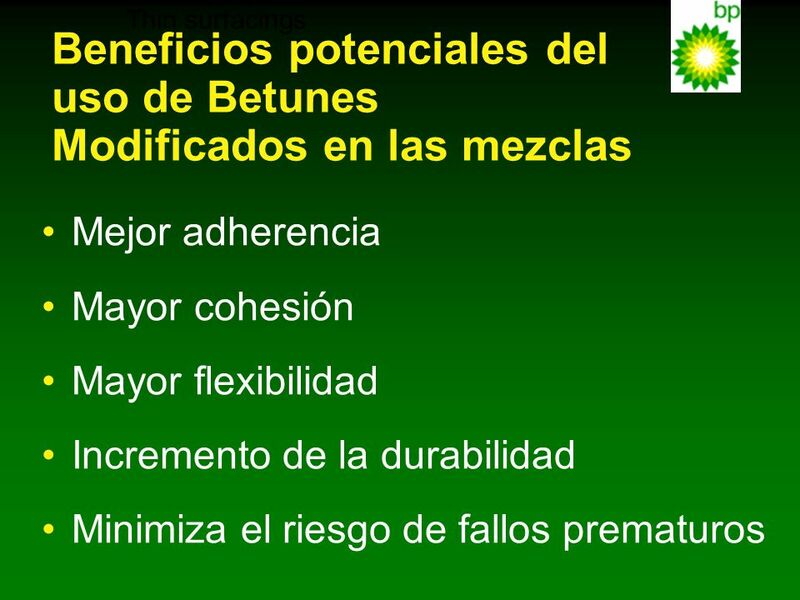 Thin surfacings Beneficios potenciales del uso de Betunes Modificados en las mezclas Mejor adherencia Mayor cohesión Mayor flexibilidad Incremento de la durabilidad Minimiza el riesgo de fallos prematuros The advantages of using PMBs are probably, by now, fairly well known. It is worth re-iterating that in the thinnest of the paver-laid surfacing layers, PMBs are specifically used because only through using such binders can the performance guarantees be hoped to be achieved. The two aspects which can not be easily measured but are well documented are the increased opportunities for using thin surface layers and the minimising of early failures. This latter point is critical, because the thinner the surface treatment, the more critical it is that all laying operations (and weather conditions) are monitored. Attention to the finer detail at the application stage must never be over-looked. The use of PMBs with their greater tolerance to adverse conditions, allows for a lower incidence of early road failure. 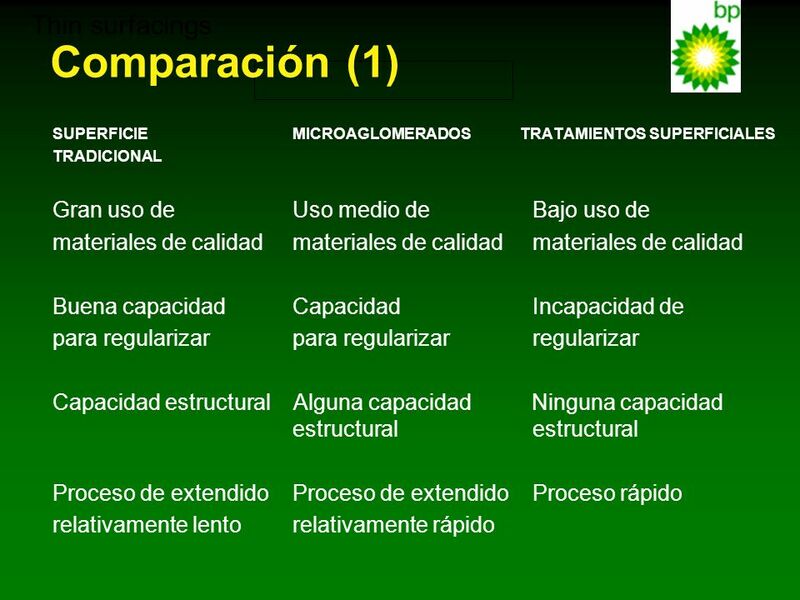 Thin surfacings Fabricación y extendido Cambios mínimos en los procesos de fabricación Transporte al tajo de obra en camiones normales Puede extenderse usando maquinaria convencional Procedimientos de compactación habituales Extendido más rápido que en capas de espesor normal La carretera puede abrirse al tráfico en 30 minutos Thin surfacings are generally laid using one of two processes. They are: Using an integrated sprayer/paver operation where the bond-coat is applied directly before the hot-mix. With this process the very thin mixes can be successfully laid. Using conventional paving and laying equipment, where the bond-cot is applied some time prior to the paving of the hot-mix. In both cases, the bond-coat application rate is higher than what would normally be used in tack coat type applications. Mixing temperatures are slightly higher if PMBs are used than for conventional unmodified mixes and the material feed into the mixing plant should be well controlled. Paving operations are generally quicker, owing to a thinner layer. Compaction should take place immediately after transverse distribution by the paver and it is recommended that the steel-wheeled roller(s) stay as close as is practicable behind the paver. It is not necessary to use vibration to achieve satisfactory. 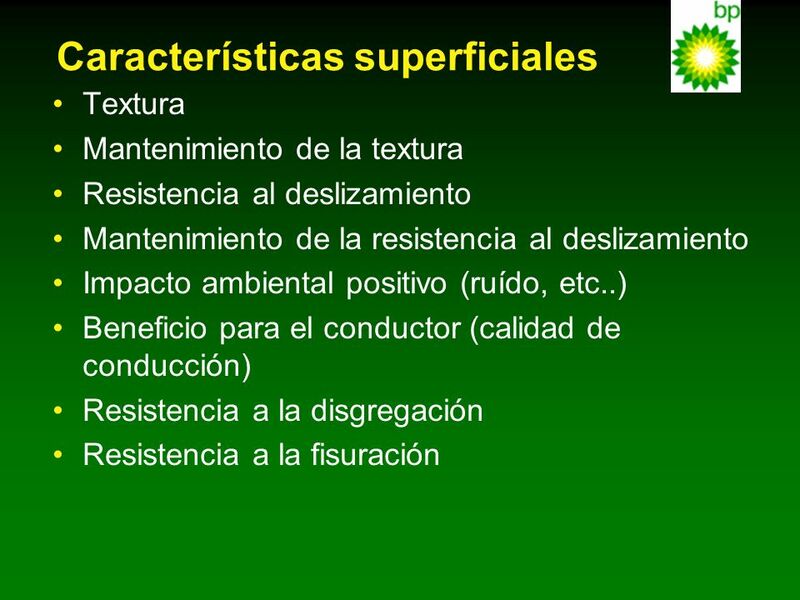 9 Thin surfacings Ventajas Restaura la resistencia al deslizamiento y proporciona mayor regularidad Dependiendo del tipo de mezcla elegido, puede producir una reducción de los niveles acústicos y las salpicaduras Mejora las características superficiales de textura y resistencia al deslizamiento Experience gained over the last years in using thin surfacing layers, has given confidence that they can be laid successfully over a wide range of site difficulty and in a range of locations. Different mixture types will provide different in-service performance, mainly depending on the grading type selected, but all are laid to provide a safe environment for the motorist. Thin surfacings are increasingly being specified in new construction and maintenance schemes for heavily-trafficked roads. In the maintenance contracts, thin surfacings are viewed as significantly reducing traffic delay times and associated costs, because the timescale of the roadworks is that much less. They have also demonstrated a service life which is cost-effective. Some industry thinking now views thin surface layers as ‘veneer’ treatments which are replaced once the surface properties are no longer acceptable, but the remaining structure (the rest of the road pavement) has an indeterminate life, requiring minimum or no replacement. 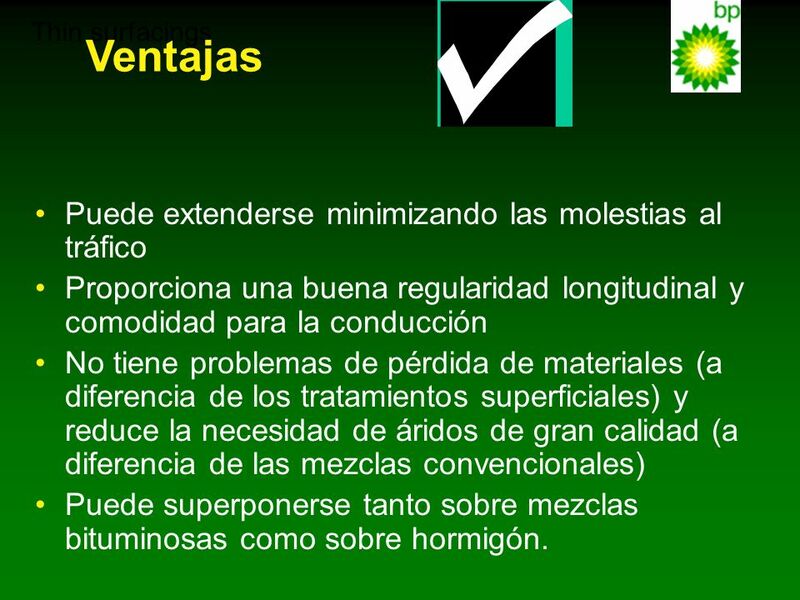 Thin surfacings Ventajas Puede extenderse minimizando las molestias al tráfico Proporciona una buena regularidad longitudinal y comodidad para la conducción No tiene problemas de pérdida de materiales (a diferencia de los tratamientos superficiales) y reduce la necesidad de áridos de gran calidad (a diferencia de las mezclas convencionales) Puede superponerse tanto sobre mezclas bituminosas como sobre hormigón. 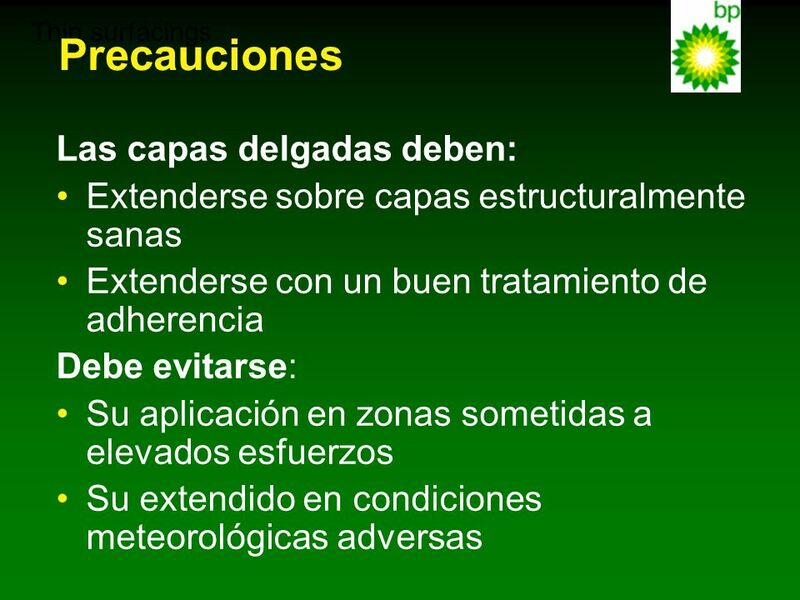 Thin surfacings Precauciones Las capas delgadas deben: Extenderse sobre capas estructuralmente sanas Extenderse con un buen tratamiento de adherencia Debe evitarse: Su aplicación en zonas sometidas a elevados esfuerzos Su extendido en condiciones meteorológicas adversas However, it must be remembered that thin surface layers should not be used to cover a poor quality road, unless it is to be used as a ‘holding’ treatment. Under all other conditions, thin surfacings should be laid on a structurally sound base and, in our view, always be bonded with a good quality adhesive tack-coat. Good construction practice would indicate that laying in high stress (high braking, high turning) locations and under adverse weather conditions should be avoided if at all possible. This is not to say some types could not be laid under these conditions but, if they are, great care should be exercised. 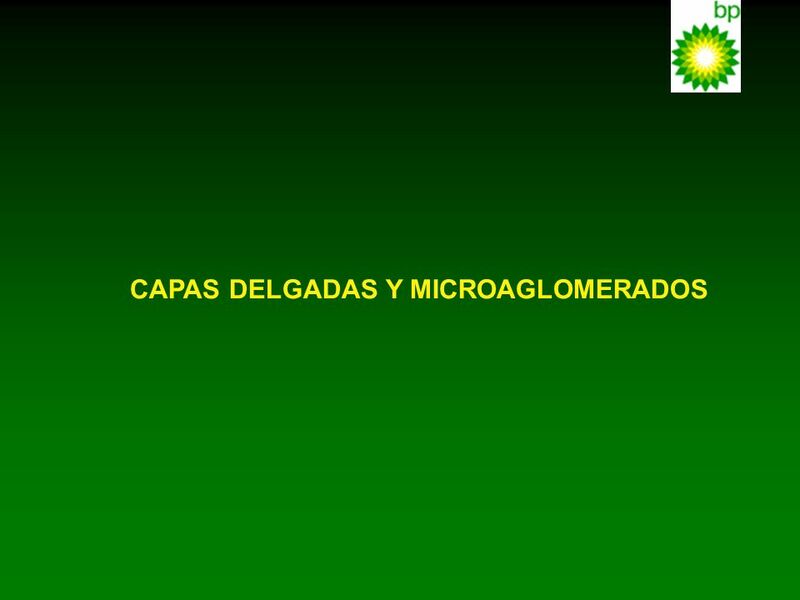 Descargar ppt "CAPAS DELGADAS Y MICROAGLOMERADOS"
Claudio Olate – AICE 2012. RESULTADOS OBTENIDOS EN LA MEDICION DEL COEFICIENTE DE RESISTENCIA AL DESLIZAMIENTO EN EL PAVIMENTO (SRV) EN LA AUTOPISTA PALIN-ESCUINTLA. Por la presente queremos darle a conocer un producto que nuestra empresa pone a su alcance. MAS CONFORT es, una revolucionaria técnica de calefacción.